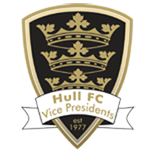 The Vice Presidents attended the Hull FC 2017 Player of the Year Awards. The VPs get the privilege of voting for the young player of the year. This year’s winner was Brad Fash. Brad was handed his award by the VP Chairman Neil Muir at the City Hall awards ceremony. Our oldest member Sylvia managed to get a snap with Danny Houghton.